Is that a head gasket? Probably too late but just out of curiousity how often do you torque the heads?
. . . torque the heads . . . ? That's the method I went with! Now to see how long it stays clean . . . I thought I remembered an O-ring or something for oil to rise to the rocker box. there are o-rings under the rocker arm assys. that need replacing. Very easy to do. You have a parts catalogue that shows them ? It's a pity that we can't make such great sentences in German. "Sie mit es durcheinander, warum?" I was thinking of doing the heads, rear engine leak, clutch and flywheel all at 100,000 miles. If I can tolerate the oil leak that long. The clutch sounds like a Steampunk Drum Band. The clutch sounds like a Steampunk Drum Band. I love letting Harley riders hear the symphony that ushers from my clutch. Nothing better than watching them look down in concern trying to locate what broke just as I happened to pull up. Priceless, every single time. I suppose I'll do them all in my upcoming 100,000 mile refresh. You know, the one I think I ought to do regardless of whether it really needs it.
. . . polish and balance the rods, balance the pistons , yadda-yadda . . .
You'll want to try to keep that cleaned off unit you have a chance to fix the leak. Mine leaked there in the past and the PO didn't clean it off. It's "cooked" on and I've tried everything but sandpaper to get it off. Someone suggested oven cleaner but I'm afraid that might discolor the aluminum. Just curious about the "don't retorque the heads" comment. Why not? In my opinion it's just an unnecessary risk of stripping one of the long anchor bolts. Retorque them after the first 50 miles or so, after the engine was well warmed up and all parts have settled, and that's it. I never had a problem with leaking head or cylinder seals. 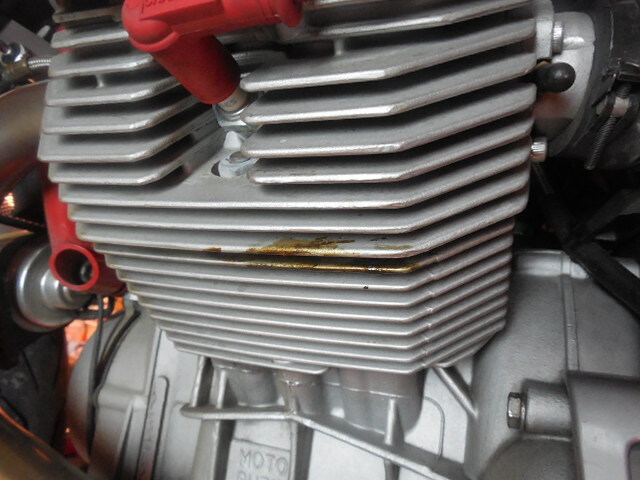 I would be remiss to retorque the heads now, after so many miles, unless I had removed them for the valves and guides. No, not on the gaskets. Only at the O-rings. Used it on old 2-stroke engines instead of the head gasket. Worked. After some years these rings might have lost all the elasticity they once had. In case they start to let the oil through they're quickly replaced anyway. Just remove the rocker bed and swap them. No new gaskets, no retorquing.